Have an iCade laying around? 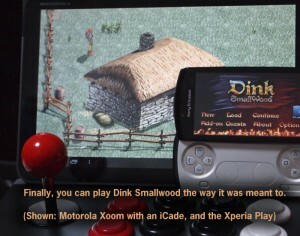 Well, start up Dink Smallwood HD V1.6.0 on your Android and enjoy beating down ducks and pigs in style. If your device will pair with an iCade, it will work great with Dink. Also added support for the Xperia gamepad and fixed an issue where DMOD midi music wasn’t working right on some devices. This entry was posted in Development/RTsoft, Dink Smallwood on July 6, 2012 by Seth.